We probably all remember sci fi films with X-Ray Specs and bionic men and thought these were about a future we would never actually see off the big screen but things are changing at speed. We have seen the intuitive vision of Pranav Mistry start to appear and can start to see the end of our interface with technology as we know it today. Our good friend and Fururoligist Ray Hammond wrote this month about two subjects which caught our eye. First was about optical Research and Development (R&D) being undertaken by US military body DARPA. Their mission is to maintain the technological superiority of the U.S.and over the years, DARPA has funded R&D that not only has improved US military capabilities but has impacted the wiser community. They are currently working with Innovega researchers in the development of iOptiks. Traditional video eyewear blocks the wearer’s view of their surroundings. A loss of peripheral vision with non-transparent eyewear for mobile applications is impractical and unsafe. 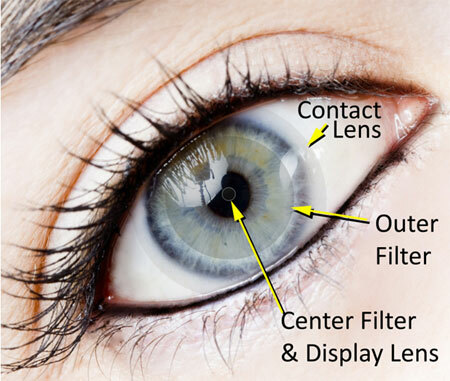 iOptiks contact lenses enhance normal vision, allowing a wearer to view virtual and augmented reality images without the need for bulky headgear such as virtual reality helmets. Digital images are projected onto tiny full-colour displays that are very near the eye. This could give soldiers better situational awareness in intelligence, surveillance, and reconnaissance (ISR) activities. The second piece of news came from the New York Times and was with respect to claims that Google is to launch data glasses by the end of the year. The data glasses are expected to cost around the price of current smartphones, or $250 to $600, be based on Andriod and include a small screen that will sit a few inches from the wearer’s eyes. They will also have a 3G or 4G data connection and a number of sensors including motion and GPS. Eyewear is described as a “natural technology interface” and one which is consistent with today’s mobile lifestyle. Sounds far fetched and distracting but it is coming soon once it finds its initial application it will no doubt impact how we look at things and interact with technology moving forward. The thought alone starts to make our current displays look like those early mobile ‘brick’ phones! Well, here's another Rights mess you've gotten me into!" A number of announcements, press articles and incidents have recently occurred, which individually may mean little, but collectively bring us to question whether we are finally addressing some of the copyright challenges we now face, or slipping further into litigation and life in the Wild West. We read with great interest the Google submission to dismiss the Author Guild’s Class Classification. The submission is a must read for anyone who believes establishing and managing rights is simple. Interestingly, this action was just dealing with primary rights. Having unsuccessfully argued one case, which was found wanting, Google have now apparently had a cathartic moment, and decided to turn everything on its head. They now set out to describe the complexity and ‘grey’ environment in which we actually trade and do so to undermine the Author Guild’s class status. Some would suggest that they were finding it difficult to convince the court on their approach to ‘opt out’ versus ‘opt in’ and on the crucial issue of orphan works and appear to be picking up their bat and ball in a huff and are now arguing that the Author Guild do not represent authors sufficiently to mount a class action. It is somewhat amazing it took Google so long to come to this conclusion and it is hoped that they do not succeed without fundamentally changing their conditions. Today we read in Techdirt about how the Canadian collection society, Access Copyright, is trying to claim that "posting a link" to a work is the same as making a copy! You would think that this lunacy would be seriously questioned and challenged but some such as the universities of Western Ontario and Toronto have apparently accepted that e-mailing hyperlinks are equivalent to photocopying a document. The result is an annual fee of $27 for every full-time equivalent student and surveillance of academic staff email. Here in the UK we have the PPL music licensing body which issues licenses to any business, such as a shop, bar, office, restaurant, gym, community building, not-for-profit organisation that plays recorded music. This sounds reasonable but PPLs method of establishing and chasing licences may leave a lot to be desired. Some may say its more about harassment, and cold call tactics an acting as ‘wheel clampers’ than education and reasoning. Are these agencies less about protecting and educating on copyright and more about collecting money to support them? Then we have the ongoing debate and lawsuits over digital rights and what may turn out to be a landmark case between HarperCollins and Open Road. Some suggest it will never be concluded inside the court and an out of court settlement is almost certain. If this were to happen then this would leaving many questions unanswered for others facing the same uncertainty. On February 17th, Paramount Pictures studio filed a lawsuit accusing the estate of Mario Puzo, who wrote 1969 bestseller "The Godfather," of approving sequels without their permission and in violation of copyright agreements. The studio claim that the 2002 agreement allowed for the publication of only one sequel novel to the movies and that "The Godfather Returns" by Mark Winegardner, was published in 2004. The Puzo estate has opted to publish a second novel "The Godfather's Revenge," and is planning a third book "The Family Corleone." An attorney for the Puzo family, claims Paramount does not have control of book publishing rights. This may prove a straight forward contract breach, but shows that in some cases the rights acquired may go further than a single work and may involve the characters within it, or the theme itself. However, it is not just the agencies and publishers that are grappling with copyright in today’s changing world, governments are increasingly being involved. On February 22, the French senate will vote on a bill allowing the digitization of works unavailable 20th century. The bill proposed by Senator UMP, Jacques Legendre was adopted in its first reading on 19 January by the National Assembly. The bill covers French orphan works which have fallen into the infamous ‘grey area’ and the Minister of Culture and Communication, Frederic Mitterrand, claims that this amounts to between 500,000 and 700,000 titles. The bill will also establish a public database and management under the BNF (Bibliothèque nationale de France) listing of all the 20th century works. The bill is aimed at protecting authors and also providing universal access to books. Some would suggest a kind of French Book Settlement. The UK Publishers Association (PA) has in its submission to the UK Digital Copyright Exchange (DCE) feasibility study, called for the development of a new online "one stop shop" for the exchange of license copyright works. . The PA makes the case for a DCE as a fully voluntary, interoperable platform, for use by businesses and the public, which could allow rights to be licensed more efficiently and openly. DCE study follows from recommendations in the Hargreaves Review of Intellectual Property, published in May of last year. So are we seeing a number of countries acting unilaterally and with different degrees of response or will the acts be rolled up under initiatives such as the EU’s Arrow project? Publishing at its heart is a rights business and as we embrace the digital age it is illogical that no one can find a rights needle in a haystack. We have been waiting for an eternity for a rights repository which would enable both the searching of ownership and the trading of permissions. But as Google have concluded in their latest court submission rights is a complex business and establishing them is far from simple. The legal wrangling of today may look to be moving forward but as ever the only ones who are gaining from it are the lawyers. When we wrote the Brave New World report, we expected the digital audio market to take off. After all, the devices were already there, the download mechanisms existed, the bandwidth was there and MP3 was going DRM free with music. All we had to do was to plug in the earphones. But it didn’t happen and instead the ebook lurched forward, took off and we forgot the audiobook. The reasons for the lost audio opportunity were many; Amazon’s acquisition of Audible and their retention of the old book club model, the lack of digital content, the cost of production and subsequent high ticket price of audiobooks, rights etc. We were stimulated with launch of Silksoundbooks.com in June 2007. It appeared to have all the boxes ticked being backed by top tier actors such as Bill Nighy, Judi Dench, Richard E Grant and Jane Horrocks and it was also selling titles at a reasonably low price of £7.95. It was as if the classics were going to get a lift and digital audiobooks were to happen. 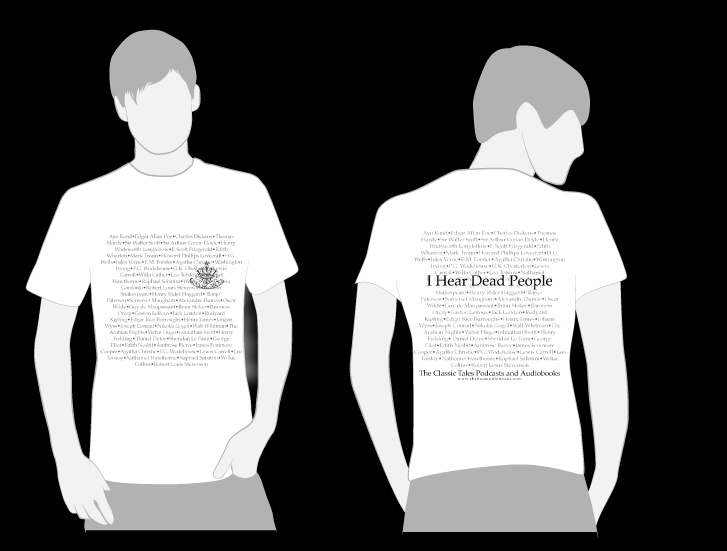 Sadly the 60 initial titles remain and the expected ‘1,000 within three years’ didn’t happen. Last night we were a panel guest on Litopia After Dark and met a fellow panellist BJ Harrison. BJ has started his own classic digital audiobook venture based in Utah. He again has chosen the classic public domain route and now has some 150 titles all recorded by himself and available via thebestaudiobooks.com and his iTunes ‘The Classic Tales Podcast’ , which in its first award-winning season registered 3rd in their overall iTunes podcast charts. B.J. 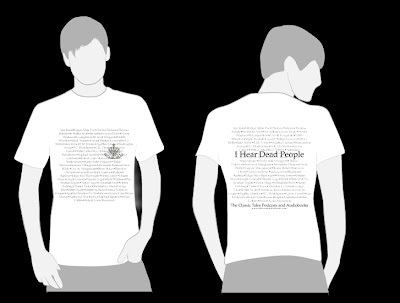 Harrison mixes the world of classic short fiction from Poe, Dickens, Hardy, Stevenson, Fitzgerald and many others, with the longer classics of Twain, Dumas, Stevenson. The list of authors reads like a ‘Who’s Who’ of classic literature and he has not restricted it to North American. His prices are very very keen and should appeal to a wide audience seeking a listening read at a bargin price. Its approach is very similar to the successful action Wordsworth Editions took to bring down the price of printed classics. We were stimulated by what BJ has achieved and although some may say its only on a small scale, it again raises the opportunity and a way to do things differently. He mauy have taken a similar route to Silksoundbooks in adopting the classics but there is no reason why the approach and model can’t be used by authors under a collective umbrella. Does the audiobook stand in its own space, or will it become just a text to speech device feature, or an additional file element to an enhanced ebook? We think that the audio format has a place and is not just for the visually impaired. Again we are drawn to Dickens and the short instalment or episodic release. The enthusiasm with which he captivated hie audiences and drove his sales of the books. What a fantastic way to release a story in the digital age and even a different way to sell and market a story..
What separates Amazon from the crowd and makes it a true bookseller may be its understanding of the lifecycle of books and of consumer needs and desires. It has always excelled at customer service, but it is its ability to breakdown the barriers that separate the various bookselling channels and go where others often fear to tread that we believe really separates them and makes them different.. This week we stumbled upon what we regarded as a new Amazon Trade In service which truly reinforces their ability to look at the market needs and drive change. We always respected our old friend and consummate bookseller Fred Bass of Strand bookstore in Manhattan. He bought New York’s review copies when the Reviewers had finished with them and sold them often even with the Editor notes still inside. He stood at his counter and bought used books on the spot. Some copies were rare, others not so rare, or even old. He understood that reader’s shelves weren’t virtual and owners often needed to sell some books to make way for new ones. It was the perfect recycling system and another reason to visit The Strand. We also remember speaking at the IBF conference in South Africa in 2007 and learning from the Russian delegation about a ‘Second Life of a Book’ scheme in Moscow. The scheme enabled books be returned to any bookstore that stocked the title. No receipt required and as long as the book is in mint condition the retailer will hand back 50% of the retail price of the book. They don’t give it refund in cash but in the form of an electronic top up on a book debit card. The book is then returned to the shelf and sold at 10 to 15% discount. The returns can also only be done between the hours of 10 and 10 on a Saturday. The point is that books can have a second life, they do have a value, they can be recycled and readers only have finite shelf space. Amazon now has created ‘Amazon Trade In’. 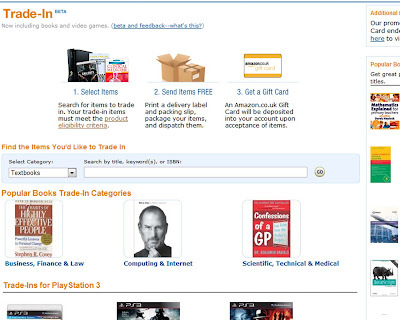 It is an online service that enables users to match their products be they books, DVDs, games to the exact version displayed in our Amazon Trade-In Stores. This obviously is a ‘beta’ service and today Amazon strictly ensures that they retain control of what they accept. Against the listed acceptable items will be specific trade in conditions and once accepted the users prints off a delivery label and packing slip, dispatches the items and receives an email confirmation. An Amazon.co.uk Gift Card will be deposited into their account after the goods have been received. There are various categories with Digital Games for; playstations 2 and 3, Xbox360, Wii, Sony PSP; Physical Books on Business, Finance, Computing, Law, STM, textbooks. The fiction books listing looks very sparse and has many different renditions of the same title and often at very low price points. It is obviously still beta and will be interesting to watch especially on high ticket book genre such as initially listed. Students have always traded their course books and Amazon has always accommodated used books and even owns ABE for trading rare books. We found the Trade in forum page interesting. The second most discussed topic was on trading in ebooks and asking if Amazon would extend the service to cover this obvious opportunity. Amazon today does not trade in ebooks but there is an obvious market demand for it. If offered, it could not only ‘lock in’ readers further to the Amazon Kindle platform but also help them offer low prices. Imagine, Amazon sells you a ebook, you read it and then trade it in and the best part is that the ebook never really leaves the Amazon warehouse! It continues to question the old ownership model and the current lack of first sale doctrine on ebooks. Why would you buy an ebook that you couldn’t trade in with Amazon in the future and that may be locked into a DRM (digital rights management) service Amazon would not accept? Would other technology companies be able to, or wish to respond? Who knows, there could be a special levy to reward the author on secondary sales. Although many will firmly say ‘no’ and that it will not be permitted, we have to also consider the impact of not addressing an obvious market opportunity. Business models should reflect market demand and the trick is to make them a ‘win win’ for all. 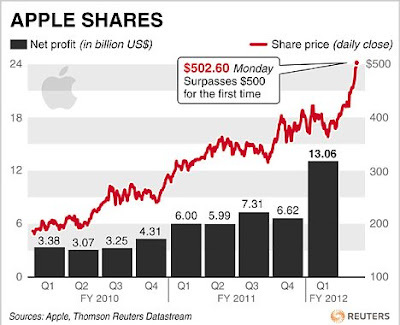 In 1997 Apple share were worth as little as $3.19 and the company even faced the possibility of bankruptcy. Yesterday, the shares passed $500 (£317) a share for the first time and rumours and enthusiasm continued to mount about the new iPad. It is a truly remarkable turnaround and values Apple today at some $460bn. There are reports claiming that Apple has ordered some 65 million 264PPI 'Retina Displays' from Samsung and LG for its iPad 3 assembly line. The numbers if correct would indicate that they expect a significant uplift in sales over that of the iPad2, which was released only a year ago. With the anticipation that an iPad 3, will be announced on March 7th, it appears clear that Apple is confident its 3rd generation iPad will break all previous sales records. Enter the dragon in the form of China and two stories which although unrelated have the potential to impact the party. Who Owns The trademark iPad in China? Apple is a brand leader and has created a family of iconic brands and patented technology which it has protected and managed with vigour. Today it faces a trademark battle with Chinese company Proview Technology over the 'iPad' trademark. Apple had paid some $55,000 to buy the European rights to the "iPad" trademark from Proview's parent company. Proview had registered the mark in several countries back in 2000, with China being added in 2001. Proview now claims that it holds the right to the name "iPad" in China and that this was not sold to Apple. So is this a false claim by Proview, or will Apple have to dig deep to now buy the mark that they have globally established? The challenge for Apple is that it is in China which can’t be ignored and is now a super economic powerhouse and also one of their major markets. A court in Shenzhen in December dismissed Apple’s claim that it owned the iPad name in China and following the ruling, Proview requested the authorities in over 20 Chinese cities to investigative whether iPads were being sold. Now Chinese site Hebei Youth Daily reportsd that on Monday China's Trade and Industry department was actively confiscating Apple's iPads from store shelves in Shijiazhuang, because the tablets are, ‘being sold in violation of Chinese trademark law.’ Authorities are also reported to be acting in a second Chinese city, Xuzhou. Lawyers representing Proview Technology are also reported to be seeking a ban on exports of iPads from China. As China is a key manufacturing base for Apple, this move could have an impact on iPad global sales. However, an out-of-court settlement is expected, with the next court hearing due on February 22 in Shanghai. Some analysts expect a settlement could be around 10 billion Yuan ($1.6 billion US). A high price to pay but one that shows the value of the global iPad brand. It will not be the first brand ‘mistake’ by Apple who famously had a long standing dipute with the Beatles Apple organisation and even tried to claim iTV without a thought for the UK company ITV. Some would suggest that the fact that China recognise trademark law is a huge step forward and that they are using it against a western company is somewhat ironic. In a second Chinese issue Apple find themselves under the scrutiny of employment ethics on the issue of using underage workers and also the earnings of the workers in its supply chain. Speaking at a Goldman Sachs technology conference Apple CEO Tim Cook tackled the topic of conditions in Apple's supply chain in China and other countries, ‘Apple takes working conditions very seriously, and we have for a very long time. Whether workers are in Europe or Asia or the United States, we care about every worker. Apple's suppliers must live up to this to do business with Apple. However, CNN recently interviewed an 18-year-old employee at Apple’s Foxconn, a key supplier, where a worker claimed that she was forced to work overtime and did not receive benefits and sick days. Last month The New York Times claimed that Apple found ‘consistent violations’ of its code of conduct after inspecting 396 of its facilities. They cited that; ‘The workers assembling iPhones and iPads…work excessive overtime’ and that, 'Some say they stand so long that their legs swell until they can hardly walk.’ Worse still, there have been a number of attempted suicides at the Foxconn facilities and it is claimed that last month, 150 Foxconn employees threatened to leap from a three-story building after claiming of poor pay and pressurised working conditions. Apple has subsequently asked the Fair Labour Association (FLA) to audit Foxconn facilities in Shenzhen and Chengdu, China. It is then planned that the audit will then move on to other Apple production partners. Apple says that by the time the FLA is done, facilities that produce more than 90 percent of its products will have been inspected. Cook stated that in January, Apple collected data every week on more than half a million workers in its supply chain and achieved 84% compliance. However today, The Korea Daily, raised the issue of worker pay and claims that factory workers in China who are producing iPads collectively earn about $8 per unit or about 1.6% of the cheapest iPad's price. This contrasts starkly with with Korean factory workers, who earn about $34 per unit or 6.8 % of the sales price. Apple is probably better than many on the issue of ethics, but they are also now more visable than probably all the others. As their share value and sales continue to rocket this raises many obvious questions. So the ethics issues have to be faced head on by the company if it is to retain its valuation glow. Is There a New eBook Club Model? As ebooks diverge in many different directions we find that we are often still left with the same 'buy to own' business model. We have long argued for ebook rentals not just for libraries, but in general and believe that the market is ripe for a 'Netflix'or 'Spotify' for ebooks. 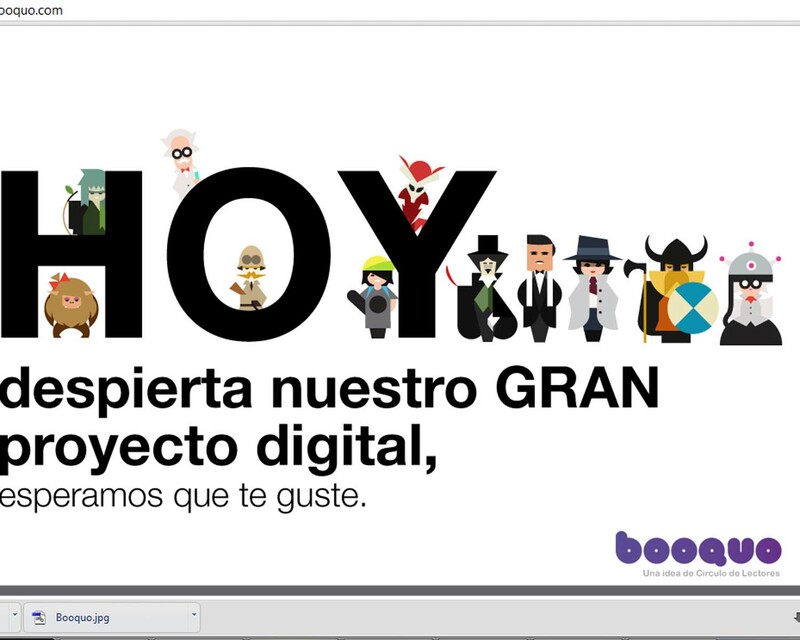 Ballantine books today have launched a new digital platform 'booquo' and claim a wide range of Castilian ebooks for their Spainish community. 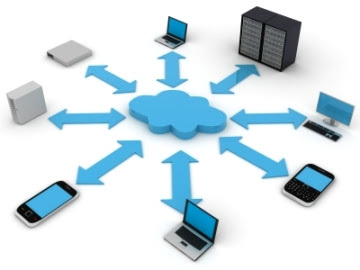 The service will be available via a Digital cloud based Library Club on monthly subscription. The cost is reported to be 9.90 euros per month and entitles "a monthly reading of digital books available" and the basic book club. Those who are already members of the book Club, will only pay a fee of 7.90 euros. However our interest soon waned as we read the usual book club demands that you purchased a book every catalogue and thought what a wasted opportunity. When will the dying breed of book clubs that use the old ‘BCA’ tired and dated model learn? Imagine, a ebook club which had hundreds of thousands of ebooks, which you could read free on a monthly subscription. If you wanted to buy the book you pay the rate card and it’s yours, if you just want to read it you could do so online. You could be restricted to a small number ‘free reads’ per month and if you wanted more you pay a higher subscription. The service could carry advertising and royalties would be based on loans and advert revenues. It could even be multi media and carry audio, films, music and games. Some will say that we are dreaming, but I bet we aren’t the only ones. The above poster comes from Sarah Houghton, who is the Acting Director for the San Rafael Public Library, Calofornia and writes a blog Librarian in Black. 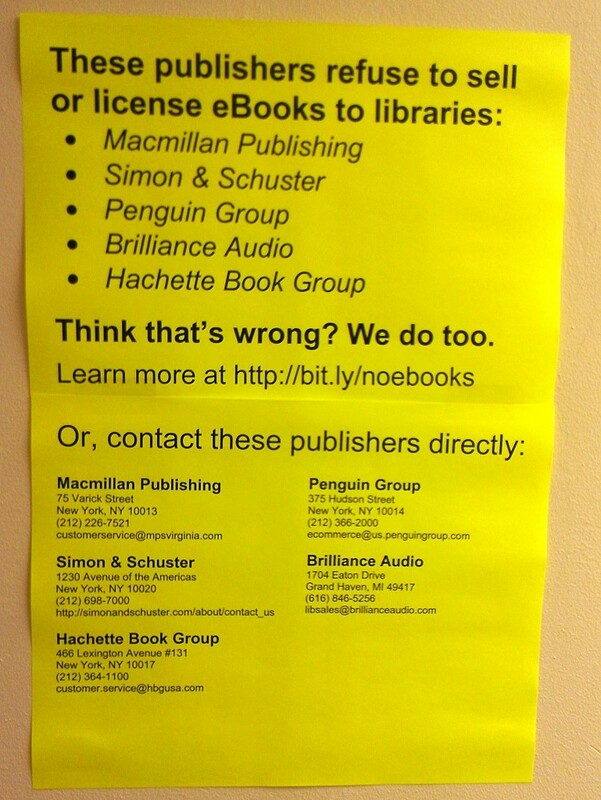 In frustration to the current non supply of some major publisher's ebook titles, Houghton had posted the notice on her library wall. Yesterday, Penguin added fuel to the debate when it announced that they have effectively shutting down their ebook relationship with the major digital public library service provider, Overdrive. We find ourselves now asking many questions about the state of digital public library support from publishers and the thorny issue of the ebook rent and loan business models. Why are some refusing to allow public libraries to loan out their ebooks which are freely available to buy in the market? Why has Penguin withdrawn its ebooks from the Overdrive digital library service? 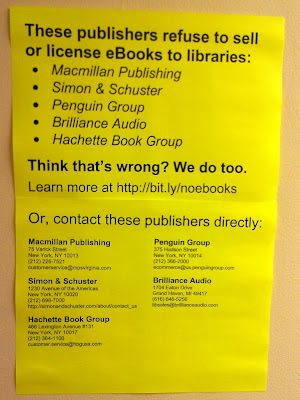 Why has a prominent group of major publishers refused to supply ebooks to public libraries? Why did HarperCollins previously invent a rule that said ebooks wear out after the same number of loans as their physical counterparts and must be bought again? Why are some insisting that library lending has to be done physically in the library and not over the networks? If we look at the public library we see the friction many predicted between publishers and the libraries over digital content. You can wrap it up many ways, but at the heart lies commerce and the challenges of download to buy versus loan for free. If libraries seize the opportunity to loan ebooks and appeal to a wider and larger audience they could undermine today’s revenue streams. If they don’t seize the digital opportunity and remain wedded in the physical world they could spiral into obsolescence. Some would suggest that libraries charge for ebook rentals and also sell downloads, but does this work against their public principles. Some would ask why publishers aren’t renting books out direct themselves and why we are still wedded to the ‘ownership’ model in a virtual world? If there were to be a significant shift in market demand, do publishers have rental models that would hold water? Some like Bloomsbury Online are quietly forging library relationships and moving forward, whilst others appear to be standing firm behind the barricades and not moving. The Overdrive service is not new and it is the dominant provider to public libraries today, not just in the US, but increasingly in many countries. The libraries like the retailers have left it to third parties to invest and provide the common platform and repository. Was this wise, – probably not? Was it inevitable given the funding, – probably? However, we are were we are and it isn’t going to change for some time. The tragedy is that these battles are being fought in public at a time when we all try to help reposition the public library in the face of disruptive change, spending cuts and even closures. It would appear to be more about reacting to change, not from a collective, but a singular perspective. When we look at the book supply chain in its most simplistic form we find; authors, who create the work; Publishers, who acquire the rights, develop, hone, produce and take the work to market; Retailers, who promote and sell it and finally, the consumers who buy and read it. The Physical book supply chain was always made complex by the sheer numbers of unique titles, from thousands of publishers, which were sold through thousands of retailers. Consolidated publisher distribution and third party wholesalers helped aggregate the bulk, but it remained a ‘many to many’ and crowded supply chain. Some saw this as a weakness, but in reality, it was a strength, which despite its inefficiencies, it gave us great diversity. In the late 90’s online bookselling saw both publishers and even retailers handing over their internet sales and customers to new internet entrants. It was amazing to see even large retailers initially prepared to duck out of the internet and align their internet fulfilment with the likes of Amazon. Some woke up and started to create their own internet offers as they realised that it was just another channel and it was their customers and margin that they were handing over. Others were happy to sell someone else’s range, through a customised generic ‘white label’ websites and just collect the commission on sales and many publishers developed their own web sites but still often handed over the fulfilment and sales to others such as Amazon. Around 2006 the ebook re-emerged. It was now driven by a new breed of eink devices and a digital network capable of supporting media. Many decided it was too expensive, too difficult, or too risky to compete and again handed over the trade to a handful of digital aggregators/retailers. Many just sat on the fence and waited to see if it would happen. As a result we now find the ebook world is effectively serviced through a handful of digital aggregators which include the ever agile and market dominant Amazon. As a rule aggregators do not link to other aggregators to retrieve files, but instead demand all files reside in their own repository. Some would suggest that the ebook supply chain just got very simple and cut out the majority of bookstores. Ventures such as Indiebound offer bookstores the white label solution, but the reality is, that with the exception of the likes of Barnes and Noble in the US, the retailers did little to embrace and invest in ebooks. Many publishers were happy to create ebooks and were happy to mix direct marketing with indirect fulfilment. We now even have an ‘honesty box’ sales environment were publishers no longer count the units out the back door. They hand over a single file and then rely on sales reports from others on how many units actually shipped and at what price. A few however adopted a different approach. This separated the different activities associated with the sale on similar principles to the ‘drop ship logistics’ that is used by many in the physical and internet world. Here the retailer can sell anything from anybody. The customer finds the ebook at the online store pays for it and their cash transaction is processed locally. When cleared the transaction is automatically transferred via web services to the digital repository holding the title with instructions to ‘pick, pack and dispatch’ it electronically to the consumer. Once downloaded the retailer is notified of the completion and the whole process is completed all in real-time. Some would suggest that is what happens today and to a degree they would be right. However, the fulfilment is often by one aggregator. In 2007 we created ‘digital drop ship’. This could use a combination of digital repositories many hosted by the publishers. The web service coding and messages were standard and the location of the file could be determined either locally at the retailer or remotely at a clearing centre. The same infrastructure could also support library and other rental services. We could go on but the point is that the publisher were still able to send files as they do today to the half dozen major retailers and then service the rest themselves. They effectively be counted the downloads out of their own backdoor and controlled their assets. Importantly they now enabled anyone sell their ebooks, with no commercial risk, retaining tight control over their inventory and never letting a single unit out the door until it was sold. Some may say we are dreaming, but it exists today. Today we find the power in the ebook supply chain is shifting firmly into the centre - to the aggregators. As we have seen these then can be or become retailers, restrict the market to their white label offers and importantly control the channel. They could also become publishers themselves, initially in self publishing and later by their own imprint or perhaps acquisition of other’s lists. We have also seen the movement away from devices and towards the ‘closed platform’ often with its own DRM and file format nuances. The likes of Amazon, Apple, Kobo, Barnes and Noble platforms all close down the opportunities for others and have become the new ebook ‘king makers’. We are not saying that ebook consolidation is bad, but we are saying that it creates new challenges, risks and opportunities and perhaps its time to consider some of these before we sleepwalk into a position we may feel uncomfortable wakening up in. 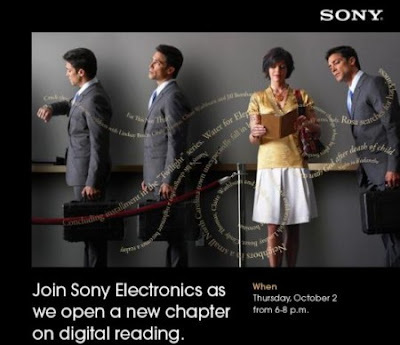 Sony’s problems would be small if they were just about their ill fated venture into ebooks. However, today Sony have just announced a 159 billion yen ($2bn) net loss for the last quarter of 2011 and have slashed their full-year forecast to a loss of 220 billion yen ($2.8bn). Hard times, require hard action and Sony have reacted and announced that in April ex-PlayStation exec, Kazuo Hirai will take over from Howard Stringer as Sony president and CEO. The reasons for the challenges facing Sony are as many as the different markets they deal in. They include the implications of the losses it made on selling its S-LCD display shares to Samsung. Also there is the cost of the migration of Sony Ericsson back to Sony with the associated creative accounting on deferred tax assets and a fickle electronics market,where Samsung have eaten into Sony’s once strong market share and it has dropped some 15.7% in the last quarter. Then we have the floods in Thailand a strong Yen and a sales drop of some 24.4% in its consumer products and services sector. Even Sony Music and Sony Pictures didn’t lift the gloom with Picture only registering a modest profit and Music seeing a sale year on year decrease of some 11.7%. Its hard to see Sony making a comeback into digital publishing and its offer would require some serious investment and change of fortunes at a time when the business obviously reqires to focus on its core operations.So as Waterstones look set to announce another partner is Sony's ebook venture at the end of the road? The one thing that you can say about Kobo is that they remain focused and determined to forge an international offer and pit themselves in the face of some formidable competitors. Their international strategy was eloquently conveyed by their evangelist and Vice president of content, sales and merchandising , Michael Tamblyn, speaking at the Digital Book World conference in New York. Michael said that when you start from Canada you have no option but to go International. Michael’s presentation is good and well worth a listen and brings home some of the realities of managing a tight roll-out to many countries and the need to segment operations and stick to a template approach. They aim to establish themselves in 12 more countries this year, which may not sound that ‘gun ho’, but is a country a month and will get harder as they break out of the English speaking and ‘western’ markets. However, international growth, which is heavily reliant on ‘partners’, can have its challenges. Last weekend we visited a large WHS store and saw first hand how a partner can let you down badly. Getting some retailers to treat it better than just an instore franchise is itself a challenge, but this was in what was a ‘hotch potch’ of a ‘pick and mix’ store that frankly made the old Woolworths look good and was hardly aligned to the messages Kobo needs to get across. Yesterday, Asda announced that they would be selling the Kobo touch reader for £87 which is just under the Amazon Kindle price of £89, which enjoys the Amazon brand and is backed by significant mainstream advertising campaign. Simply relying on spot buys, bin end POS and a comparable price isn’t exactly pushing the boat out. We have already seen how the old Waterstones was unable to retail ebook readers in store. Its one thing to have retail partners, its often another thing altogether to control their representation of your offer. Michael presents some very interesting figures for Kobo sales of self published titles in various countries. Self publishing represents some 7% of US unit sales, this rises to 8% in Asia, 9% in South America, 10% in Australia, New Zealand and Europe and 14% in Africa. He explains some of the reasons behind the local variances but the percentages are somewhat higher that we expected and demonstrate that the opportunity that is potentially starting to blossom under the ebook umbrella. Michael also shares some interesting insights on local and global pricing which demonstrate how many publishers still see physical and digital pricing locked together. Kobo are now within the Japanese giant Ratuken, which will give them better backing and they know that they will need it as they race to get themselves established in many countries and across all the continents. This is about raising brand awareness and credibility just as much as it is about service. Whilst Barnes and Noble still today remain largely unknown outside of publishing and the US market, Kobo now has a better street profile in a growing number of countries. It will be interesting to see how the Kobo brand stands up to the potential Waterstones’ adpotion of B&N’s Nook and how they both compete with Amazon in the UK later this year.